If you're familiar with the cartoon M.A.S.K. (no, not the Jim Carrey one), you're probably an 80's kid like me. M.A.S.K. was one of my favourite cartoons! I always wanted to do a 3D model of Thunderhawk ever since I learnt how to model cars, so when I had to do some box modeling for my class assignment, I decided to do it. 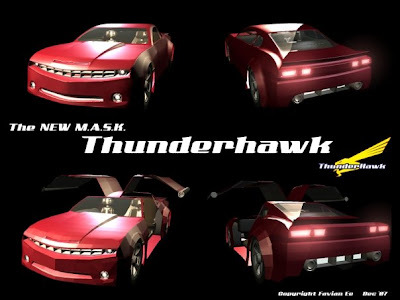 But lo and behold, I couldn't get the blueprints for the original Thunderhawk, and I couldn't get my hands on the toy. So instead of using that old Camaro model, I substituted it with the new Concept Camaro (a la Bumblebee). Since the new model's spoiler at the back is fixed, I did away with the raised spoiler/bumper thing and just added the afterburners below. The model's far from perfect due to time limitations, but I guess it's good for starters.